The Pagoda Hotel is bringing Aloha Friday music back to the property every Friday this month. Performances by some of Hawaii's top artists will begin at 8 p.m. at the LaSalle Lounge, atop the Pagoda Floating Restaurant. A two-drink minimum will be in effect. There is no cover charge, and a pupu bar will be available at $15 per person. The pupu bar and drink service will begin at 6 p.m. The Pagoda Hotel is at 1525 Rycroft St., between Keeaumoku and Kaheka streets. Validated parking is available for $3 in the nearby Ross Dress for Less parking structure. 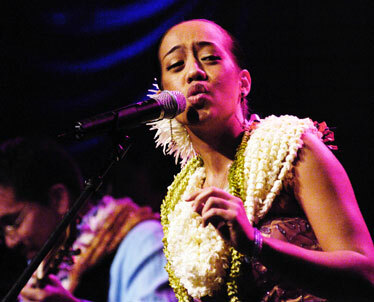 Raiatea Helm is among the performers at Pagoda Hotel's Aloha Fridays. Makalei Golf Club, in upcountry Kailua-Kona, will be offering "Four Play for the Price of Three" for kamaaina from Nov. 17 to Christmas. The special offers a $49 kamaaina greens fee (standard fee is $85) for the first three players, for an average of $36.75 per person for four players. The special is valid for play any day at any time, subject to tee time availability. A Hawaii driver's license is required for each player. Makalei is an 18-hole championship course overlooking the Big Island's Kona-Kohala coast from the lower slopes of Hualalai, offering a cool, scenic woodland experience. It is one of only five courses in the state to feature Bentgrass greens, the "grainless" alternative to Hawaii's more common Bermuda putting surfaces. The course's elevations range from about 1,800 to 2,850 feet, offering challenging play and panoramic views. Makalei Golf Club is located on Hawaii Belt Road (Mamalahoa Highway 190), a 10-minute drive from Kona Airport. Call (808) 325-6625, e-mail makaleigolf@hawaiiantel.net or visit www.makalei.com.